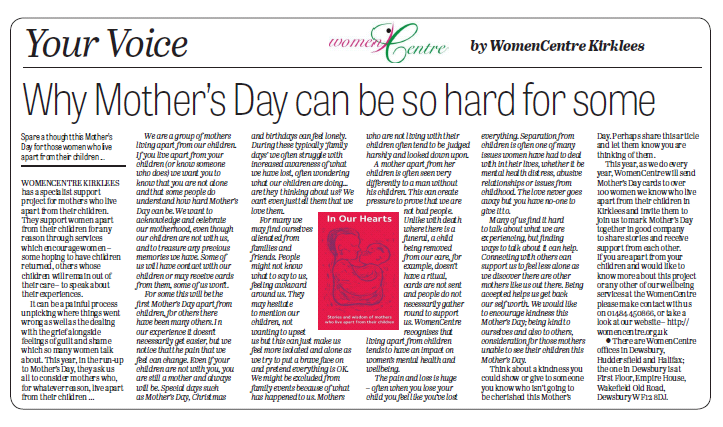 On Thursday 8th March Dewsbury Reporter printed a piece from Mothers Apart project based in Kirklees – here is your chance to see what the women have written in case you did not get your copy. WOMENCENTRE KIRKLEES has a specialist support project for mothers who live apart from their children. They support women apart from their children for any reason through services which encourage women – some hoping to have children returned, others whose children will remain out of their care – to speak about their experiences. We are a group of mothers living apart from our children. If you live apart from your children (or know someone who does) we want you to know that you are not alone and that some people do understand how hard Mother’s Day can be. We want to acknowledge and celebrate our motherhood, even though our children are not with us, and to treasure any precious memories we have. Some of us will have contact with our children or may receive cards from them, some of us won’t. For some this will be the first Mother’s Day apart from children, for others there have been many others. In our experience it doesn’t necessarily get easier, but we notice that the pain that we feel can change. Even if your children are not with you, you are still a mother and always will be. Special days such as Mother’s Day, Christmas and birthdays can feel lonely. During these typically ‘family days’ we often struggle with increased awareness of what we have lost, often wondering what our children are doing… are they thinking about us? We can’t even just tell them that we love them. For many we may find ourselves alienated from families and friends. People might not know what to say to us, feeling awkward around us. They may hesitate to mention our children, not wanting to upset us but this can just make us feel more isolated and alone as we try to put a brave face on and pretend everything is OK. We might be excluded from family events because of what has happened to us. Mothers who are not living with their children often tend to be judged harshly and looked down upon. 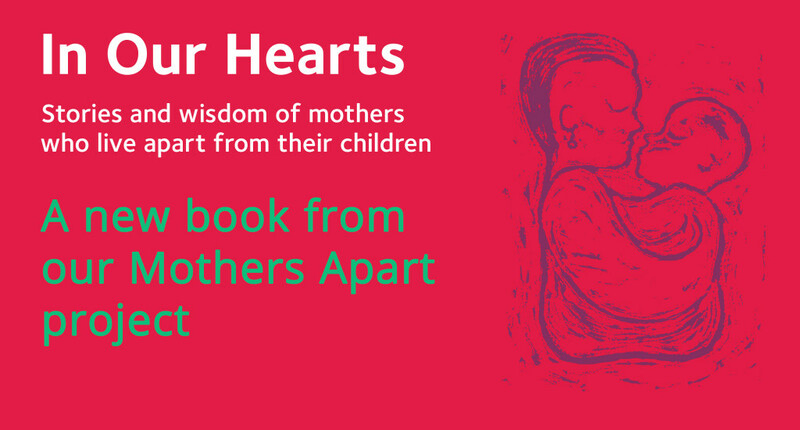 A mother apart from her children is often seen very differently to a man without his children. This can create pressure to prove that we are not bad people. Unlike with death where there is a funeral, a child being removed from our care, for example, doesn’t have a ritual, cards are not sent and people do not necessarily gather round to support us. WomenCentre recognises that living apart from children tends to have an impact on women’s mental health and wellbeing. The pain and loss is huge – often when you lose your child you feel like you’ve lost everything. Separation from children is often one of many issues women have had to deal with in their lives, whether it be mental health distress, abusive relationships or issues from childhood. The love never goes away but you have no-one to give it to. Many of us find it hard to talk about what we are experiencing, but finding ways to talk about it can help. Connecting with others can support us to feel less alone as we discover there are other mothers like us out there. Being accepted helps us get back our self worth. We would like to encourage kindness this Mother’s Day; being kind to ourselves and also to others, consideration for those mothers unable to see their children this Mother’s Day. Think about a kindness you could show or give to someone you know who isn’t going to be cherished this Mother’s Day. Perhaps share this article and let them know you are thinking of them. There are WomenCentre offices in Dewsbury, Huddersfield and Halifax; the one in Dewsbury is at First Floor, Empire House, Wakefield Old Road, Dewsbury WF12 8DJ.